Doctor Who Fourth Doctor Brown Hat: What would Doctor Who's Fourth Doctor be without his hat? He'd be a slightly less stylish, but no less brooding and whimsical Time Lord, of course! 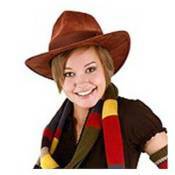 Add to your own sense of whimsy when you wear the Doctor Who Fourth Doctor Brown Hat. This felt hat has been designed to replicate the look of the very same one Tom Baker's Fourth Doctor wears on the long-running BBC TV show. The Doctor Who Fourth Doctor Brown Hat is one-size fits most adults. Ages 14 and up.